The Department of Justice is planning to release new clemency guidelines for consideration, a move that could make thousands more prisoners eligible for a reduction in sentences by President Obama. "The White House has indicated it wants to consider additional clemency applications to restore a degree of justice, fairness and proportionality for deserving individuals who do not pose a threat to public safety," Attorney General Eric Holder said in a video message released Monday. As USA Today notes, the DOJ is working toward a larger goal of reducing the incredibly overcrowded federal prison system, with many offenders serving excessively long sentences for nonviolent crimes involving drugs like cocaine. Holder explained that as the expected clemency actions roll in once the reforms are adopted, the Justice Department is prepared to meet prisoners' needs by assigning "potentially dozens" of department lawyers to review the requests. 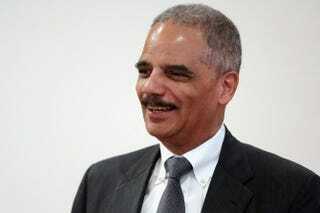 "As a society, we pay much too high a price whenever our system fails to deliver the just outcomes necessary to deter and punish crime, to keep us safe, and to ensure that those who have paid their debts have a chance to become productive citizens," Holder added in the video. "Our expanded clemency-application process will aid in this effort." Supporters for the changes in sentences, especially those involving drug offenders, cheered the decision, USA Today reports. "This would be a positive step toward righting the wrongs of our broken criminal-justice system," Drug Policy Alliance spokesman Anthony Papa told the news site. "With half a million people still behind bars on nonviolent drug charges, clearly thousands are deserving of a second chance. Congress should act immediately to reduce the draconian federal mandatory-minimum sentences that condemn thousands to decades behind bars for nonviolent drug offenses."